Pat was born and raised in Minneapolis, Minnesota and is a graduate of the University of Minnesota. After graduating she accepted a job at the largest law firm in Minneapolis as a paralegal. In 1977 she moved to Pennsylvania and continued to work at law firms, as a paralegal and office administrator. Retiring from that in 2000, she started volunteering for Main Line Meals on Wheels and was subsequently elected to the Board of Directors. In 2003 longtime Executive Director, Marie O’Neill, decided to retire. The Board named Pat as the new Executive Director. Since then she has helped with coordinating the meal delivery at the Devon location and all the ED responsibilities which continue to grow. Laura holds a BA from the University of Pennsylvania. She worked for 20 years in Corporate Human Resources and Recruiting. 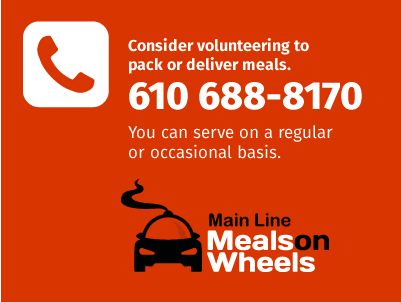 Since 2003, she has worked for Main Line Meals on Wheels as a Coordinator focusing on patron intake, volunteer coordination, billing, and donation management. She also serves on the executive board of Tredyffrin & Easttown (T&E Care) and was a longtime volunteer in the TE School District. Elisabeth hails from Westchester County in New York. She received degrees from Vassar College and SUNY Binghamton and has worked with children and adults who experience learning difficulties and physical and mental developmental differences. She has used her skills acquired in her education and work to raise four children over the last 30 years, with one child who will finish up high school in 2019. She started delivering for Main Line Meals on Wheels in 2011 and discovered what it was like to be appreciated for the things she did that previously were taken for granted. She then added packing meals in 2012, joined the board in 2013, and in 2014 took on one day a week as coordinator. In 2005, Erika left a 15 year career at SAP in Newtown Square to spend more time with her husband and two young children. She began volunteering with Main Line Meals on Wheels in 2007. During the summers, her children joined her during her deliveries which they still do as teenagers. Erika joined our office staff in October 2015 after Maureen Eisele's retirement. Betty was born and raised in Washington DC. After graduating from Penn State, she moved to the Philadelphia area and started teaching at Gladwyne School. She took a break from teaching to raise her two daughters. She returned to substitute teaching and other part-time positions including billing for Main Line Meals on Wheels. She has logged many volunteer hours at her church, her daughters’ schools, Main Line Meals on Wheels and Surrey Services. She enjoys having time to spend with family, including her three grandsons.